Over the last few years, one or two writers have made claim over Wallace hailing from Ayrshire. As this data seems to be receiving more and more credit, I, on behalf of the Society of William Wallace, would like to lay down some sort of semblance of the truth for interested parties to peruse at leisure. Many Ayrshire claims have been based around Craigie Castle, or various documents pertaining to that establishment. The ruins of this edifice stand near the village of Craigie, which lies between Kilmarnock and Ayr, close to the A77. This castle was a Wallace property, but not before 1371, when a Wallace, John by name, married the Lindsay heiress who had inherited Craigie, and so acquired the property and title. As William Wallace the patriot was born sometime around 1270, the impossibility as his birthplace is obvious. In fact, William Wallace is known in history as the Knight of Ellerslie or Elderslie. Both these names are one and the same - both mean the field of the Elder trees, and Elderslie of course stands close to Paisley in Renfrewshire. Where this mis-understanding has occurred is the fact that there is a house by the name of Ellerslie near Kilmarnock, and claims have been made by some - hard bending of the facts - that this was William Wallace’s birthplace. The fact is that this house does not appear on maps as Ellerslie before 1835, and as it was attached to a small colliery and brickworks, the chances are that it was named by a patriotic owner. We do know that the Wallaces were vassals of the High Stewards of Scotland. Renfrew today is known as "The Cradle of the Stewarts". In fact, all the High Stewards are buried in Paisley Abbey. This family came north from Shropshire on the Welsh Marches in the time of David I of Scotland. The original form of Wallace meant "Welsh Speaking", and we know that William's ancestors followed these "Stewards" north as their vassals. In 1174 one Richard Wallace, who is generally regarded as being William's ancestor, witnessed a charter to the Abbey of Paisley. The Wallaces were granted the lands of Elderslie sometime before 1250. We know that the Wallace family have always had some kind of fortified dwelling at Elderslie. The ruins which stand there today date only as far back at the 1500's, but as a house adjoining this site is called the Moat House (ancient fortified dwellings were known at Mottes or Motte Houses), the house in which William was born could have occupied either of these sites. The bottom line in all this is that there is absolutely no evidence whatsoever that the Wallace family owned at any time the lands near Kilmarnock which now contain the later house know as "Ellerslie". There are no remains of early buildings or records of them on this site. Some confusion arises because the historian John Major referred to Wallace - albeit more than 200 years after this death - as the "King of Kyle", Kyle being an area of Ayrshire, but the Kilmarnock "Ellerslie" actually stands in the area known as Cunningham, but this has not deterred some from claiming it as his birthplace. The Stewards owned land in Kyle, so perhaps this is where Major’s history is mistaken. Intriguingly, Kyle is a corruption of the Gaelic word for a wood, Coille (pronounced Kyle), so perhaps Major was right in naming him King of Kyle or King of the Forest, as we know Wallace based himself in the great forests of that time. At the Elderslie, Renfrewshire site, two famous trees once stood, the Wallace Oak, and the Wallace Yew. The yew alone remains. Some doubt has recently been cast on the antiquity of this tree, but parish records from the 1700's refer to it as "this ancient tree". As the oldest tree in Europe is a yew which stands in Fortingall in Perthshire and is over 3,000 years of age, it is interesting to think that this tree is named the Wallace Yew for other than the site of its location. The famous Wallace Oak which is claimed to have afforded shelter to William and his followers from an English patrol, finally fell in a storm in the 1800's. This ancient tree had been measured some years before its fall, when it was found that its branches covered 495 square yards! When Bonnie Prince Charlie's army began their march south in 1745, they used the words "Wallaces Oak" as a camp password. The story of this tree must have been well known for the highland soldiers to have understood its meaning. Several artifacts have also come to light at this site over the years. Around 1790 a stone was uncovered, bearing the inscription "WWW - Christ Only is my Redeemer." This is regarded to have been a William Wallace, father and son, who had inherited Elderslie in the 1400's. The estate remained in Wallace hands till 1769 when it was sold by Helen Wallace. It was acquired by an Alexander Spiers who later built the Church of St Andrews by the Green in Glasgow, where he had a plaque erected by the altar which stated that he had "bought the lands of Elderslie from a descendant of William Wallace". There is no doubt that when the poet "Blind Harry" wrote his epic paper in the 1400's entitled "The Life and Acts of Sir William Wallace of Ellerslie" he was referring to the estate near Paisley. That has already been shown by the process of elimination. Harry refers to a work by a certain John Blair in his poem. This man was a colleague of Wallace, and fought with him on his campaigns. After William Wallace's murder in London, it is believed Blair wrote his memoirs stating the facts of their life together. Blair apparently met Wallace at school in Dundee. Although his book is lost to us; Harry makes mention of it in his work, so a copy must have been available to him. With such a close link it is difficult to see Blind Harry making errors in Wallace's birthplace. 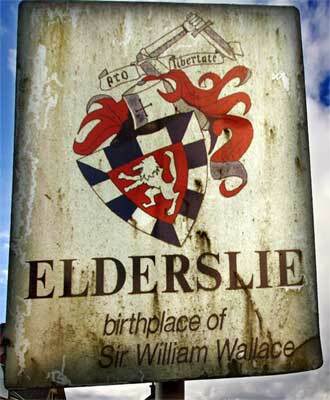 At the end of the day we do not have any document which resembles a birth certificate, so it is probably best to refer to Elderslie as being "evidently" the birthplace of William Wallace. Elderslie has always been the "traditional" site, so it is strange for some writers to say they suddenly have the truth, and that for several hundred years everyone else has got it wrong. I can honestly state that I have never seen a claim for Wallace's birthplace other than Elderslie that could stand up to more than a slight scrutiny. Most claims for Ayrshire strangely have originated in Ayrshire, but then you cannot blame anyone for trying to link themselves with the great patriot. The Stewards never owned lands in the Cunningham area of Ayrshire where the Ellerslie house stands, so as their vassals the Wallaces would not have either. We should when looking at the life of William Wallace see his early days being spent on the estate of Elderslie, which his elder brother Malcolm inherited and continued to run after his death. 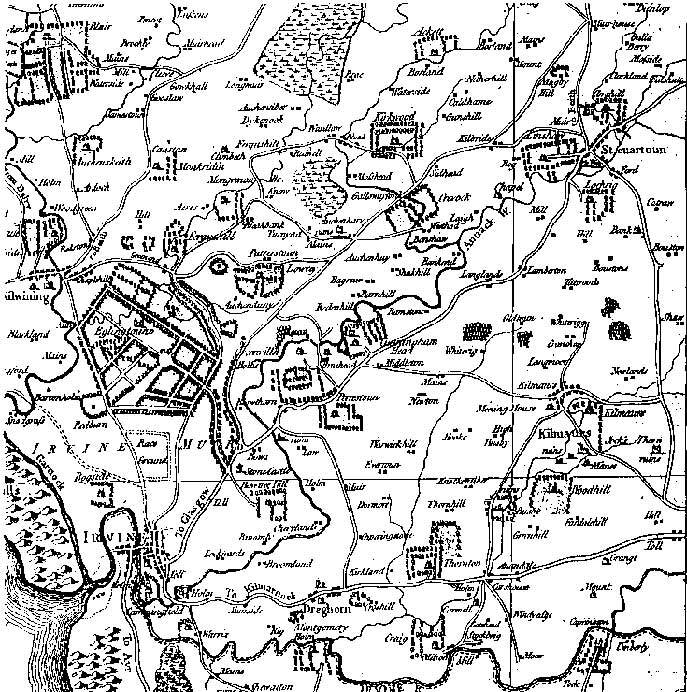 The map below dates from 1654. It shows "Ellerslie" (near the bottom left of the map) near Paisley. The Wallace property stands on the West bank of the Glenpatrick Water as the ruins do today. It is shown fenced and surrounded by parkland. 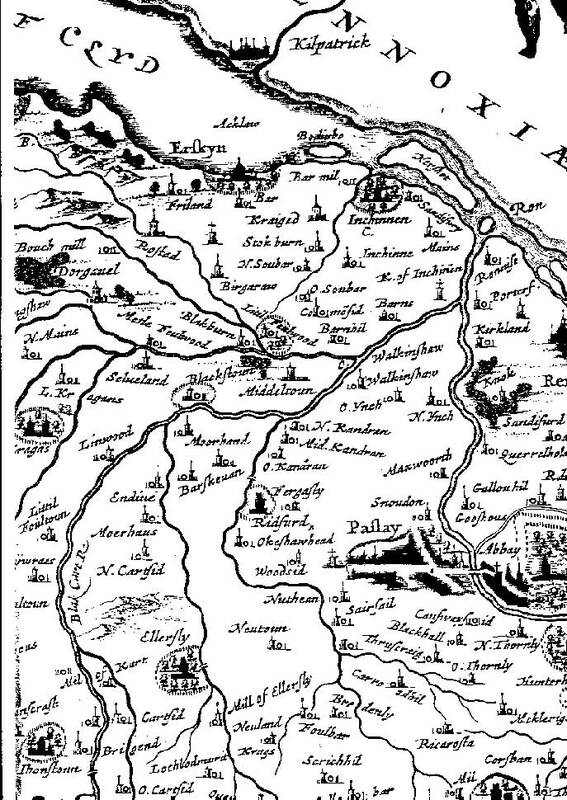 The map of Ayrshire below dates from 1775, the time of Robert Burns. It shows no trace of "Ellerslie" to the South East of "Corshouse" (later Crosshouse) near the bottom right of the map. The map of Ayrshire below dates from 1865. It shows "Ellerslie" to the South East of "Crosshouse" just below the centre of the map. Since the publication of James McKay's book, "William Wallace - Braveheart", the myth that the hero was born in Ellerslie, near Kilmarnock, has grown apace, albeit mistakenly. People seem to think that because they have seen something in print, it is irrefutable. The problem is, some authors are just too busy or too lazy, to do thorough research, using old maps, ancient chronicles, visiting sites, etc., preferring to regurgitate facts from previous books on Wallace. What happens then, is that one mistake or half-truth, when it is told and re-told, begins to insinuate itself into the public psyche, until it is believed without question. James MacKay states that Craigie Castle in Ayrshire was granted the lands of Ellerslie, near Kilmarnock in the mid 1200's, and that Craigie belonged to the Wallaces. Unfortunately, at this time, Craigie was a seat of the Lindsay family, and did not come into the possession of the Wallace family until 1371, when John Wallace of Riccarton married the heiress of Craigie. It will be noted that this was around 100 years after William's birth. James Ferguson's book of 1948, "William Wallace - Guardian of Scotland", also proposed this theory, putting Ellerslie in the county of Kyle. Lately, Mr. John McGill of Riccarton has also given Kyle as the location of Ellerslie, but they seem to overlook the fact that on the first Ordnance Survey map of 1850, Ellerslie is located in Cunningham, north of the River Irvine, which has always been the boundary between Kyle and Cunningham. So, again, research seems to be suspect. On balance, Professor G.W.S. Barrow, who as anyone who studies this period in history will acknowledge, is the foremost authority on Scotland and the Wars of Independence, has written that Elderslie in Renfrewshire is "the most probable birthplace" of Sir William Wallace. 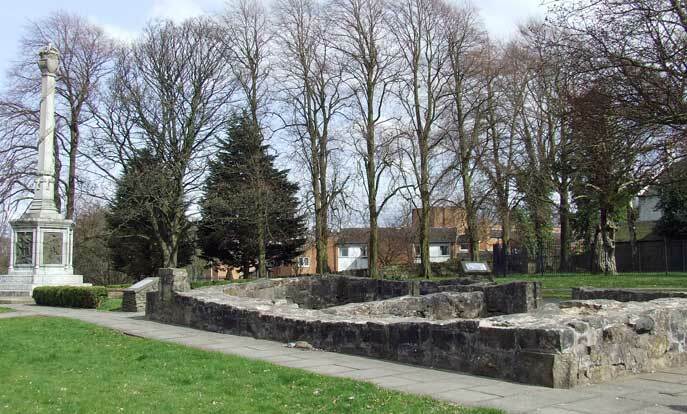 The site of the Wallace Monument in Elderslie still shows the remains of what it referred to in Martin Coventry's castle book, as Wallace's Buildings, which the Council decided to demolish in the early 1970's. 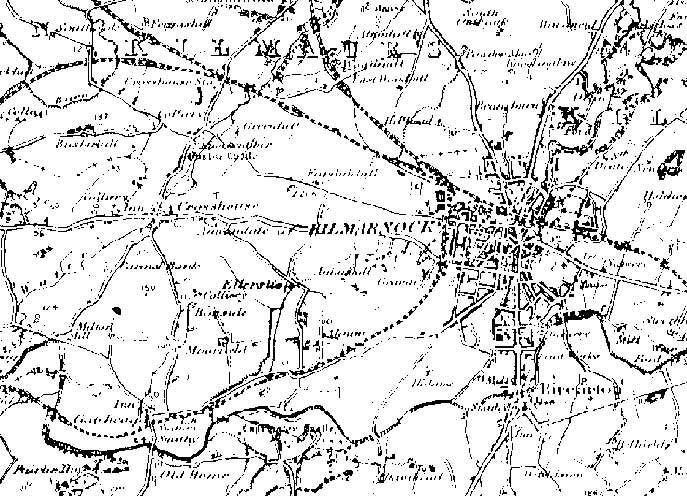 The Society of William Wallace has requested, via the national and local press, for anyone who has proof of the existence of Ellerslie, near Kilmarnock, pre-1850, as we can find no evidence of this on any maps or documents. One piece of unsubstantiated information we have come across, however, is that the village of Ellerslie in Ayrshire, basically a row of miner’s cottages, was named by a patriotic citizen, in memory of his hero.